We all seem to talk so much about our legs, often neglecting the fact that some of us have lipedema in other parts of our body as well. I know that for me, I focused so much on my legs getting liposuction that I failed to even mention that I had lipedema in my abdomen and arms. I suppose part of the reason is that, at least for me, these areas didn’t present with daily pain. Like with my legs, they were just so much a part of my everyday life, that I didn’t realize there was a problem other than cosmetics until it was pointed out to me. When I received my diagnosis of lipedema, the physician indicated to me at that time that I also had it in my upper arms. That explained a lot. Again, my arms, not unlike my legs, were misshapen and didn’t seem to respond to diet or exercise. They were lumpy and ugly, and I had just resolved myself to that fact. Long before I knew about Lipedema I was determined that one day I would have brachioplasty on my arms. I longed to wear sleeveless shirts/dresses. In fact, anyone who knows me can attest to my obsession with arms (oh Michelle Obama! ), my love of sleeveless garments. I often made jokes about how my arms could knock someone out if I swung them just right. Never once did I even consider surgery on my legs, of any kind, as the thought of anyone touching my legs was too painful, physically and emotionally. 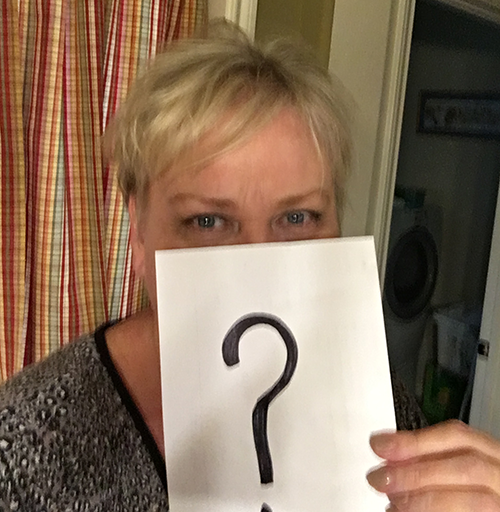 After the initial diagnosis of lipedema, everything changed. My mindset was all about the legs that were impacting my life and contributed more to my self-esteem than any other body part. The idea that there could be a solution, or a treatment was extraordinary. My mom suffered for many years with Lipedema, though she never knew its name. Toward the end of her life, her mobility was limited, she was in constant pain, and she was so embarrassed of her legs that she would not talk about them with anyone, including me. 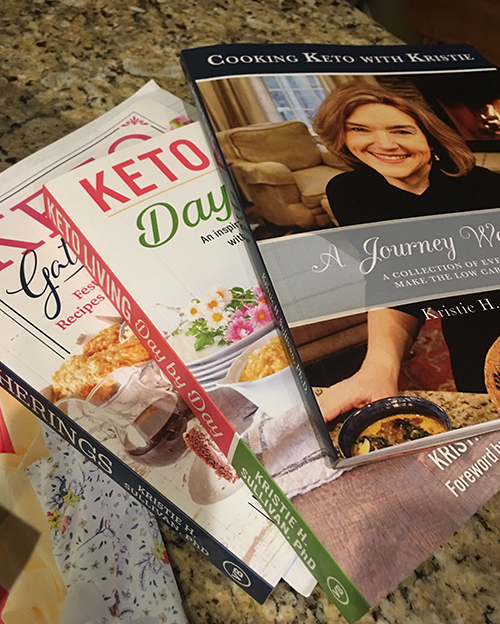 Because of her experience, I knew that I had to focus on changing the trajectory of my life. When I met with a second surgeon for an opinion, Dr. Byrd also indicated that I had lipedema in my full arms, and subsequently, my ribcage and abdomen. These areas also became a part of my treatment plan, which included 3 surgeries over the course of 4 months. I am thankful for each one. 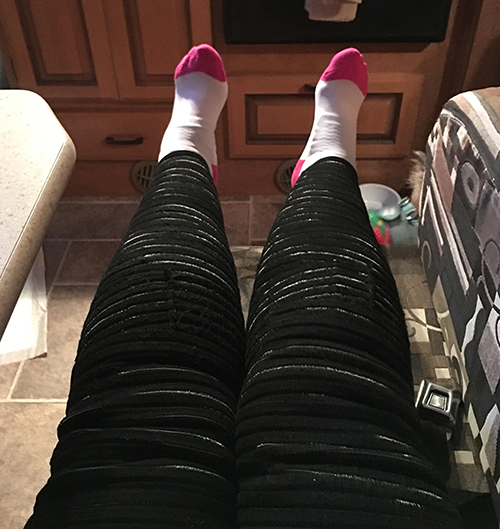 I write mostly about my legs, as you all know, and obsess mostly about my legs, but I want to share a bit about the other surgeries and results as well. Dr. Byrd did liposuction on my full arms, wrist to shoulder, in my first surgical appointment along with my lower legs, ankle to knee. She removed a total of 8 liters combined. In my mind the surgery is all lumped together so I think the reason most of my focus has been on legs is because it all happened on the same day and the recovery was all one event. Since we walk on our legs, and since they represent so much more of our bodies, it seems to have the greatest impact. However, my arm liposuction has also had a great impact on my life. 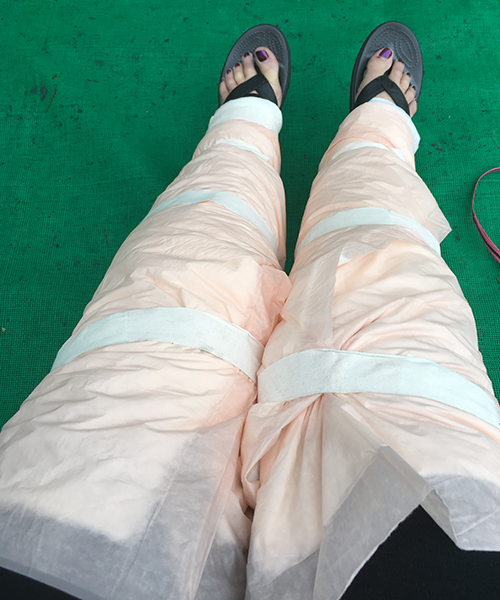 The recovery sort of got lost in the process, but was not unlike the recovery for legs… lots of swelling, bruising, burning sensations, compressions garments, etc. I remember describing the recovery as feeling like my arms were sausages with rubberbands placed every couple inches or so up the full length of my extremity. What makes it all okay, is that the improvement in the look of my arms was immediate. As with my legs, I could see an immediate change in the size and shape of them. It changed my body profile from day one. Within weeks, I could feel the difference in how my jackets, coats, sweaters, blouses and dresses fit. They hung off my shoulders instead of constricting my upper arms. My wrists were so much smaller that I had to have links taken out of my watch, as it continually rotated around my wrist or dropped onto the back of my hand. I felt small and dainty. It’s been almost a year now since my first surgery. I do not wear sleeveless clothing. The lipedema fat is gone from my arms, and my forearms look great, completely normal. But the fact that the skin had been stretched out on my upper arms for so many years; that I am 58 years old and my skin is thinner than it was 30 years ago; and that I had lost and gained significant weight, multiple times during my life, has all contributed to some loose skin/hanging skin on my upper arms. This is not the result of liposuction, as it was loose and jiggley before. One must understand though that liposuction does not tighten one’s skin. Your skin may tighten itself with time and compression, or it may not. Some women do not have the loose skin post liposuction and have great cosmetic improvement due to the fact that they are younger or experienced less damage to the skin in the first place. I am not one of those people. Still, I am happier with my arms, and if I stand sideways and look into the mirror and hold my arm just right, I get a glimpse of what my “real” arms look like. It makes me smile. The reality is that they are less heavy and fit comfortably into the clothing that is the right size for my body. I purchase jackets that fit in my shoulders and torso without having to go up a size to accommodate my arms, or feel the constant pulling and tugging in my upper arms or across my back. When all is said and done I may choose brachioplasty or skin removal surgery in the future. I am not sure. As I approach the age of 60, and with everything I have put my body through in the last year, I may just settle on being happy with what I have accomplished and with how my body looks and feels. It’s hard to say at this point. Much of happiness is determined, not by self-perfection, but through self-acceptance. I may just focus on swinging my hips when I walk, or staying balanced on high heels, or wearing brighter colors, or on smiling more! By Lipedema Surgery Center|2019-01-08T15:10:52+00:00November 7th, 2018|Categories: Lipedema|Comments Off on My Arms, My Nemesis. Arm Liposuction…the surgery least talked about.